After our Namdaemun Market stroll, our guide for the evening tour was set to meet us at 6:30pm. With an hour to spare, we had coffee and a light meal at “Angel in Us Coffee”, sort of Seoul’s Starbucks version. I liked the ambiance and the tumblers made of stainless with a fiberglass exterior finish. From Visit Korea: Angel-In-Us’s name implies that coffee is God’s gift delivered by angels. Only the best-quality arabica beans are roasted using the pure roasting system (a method of suspending coffee beans in the air to roast them evenly). 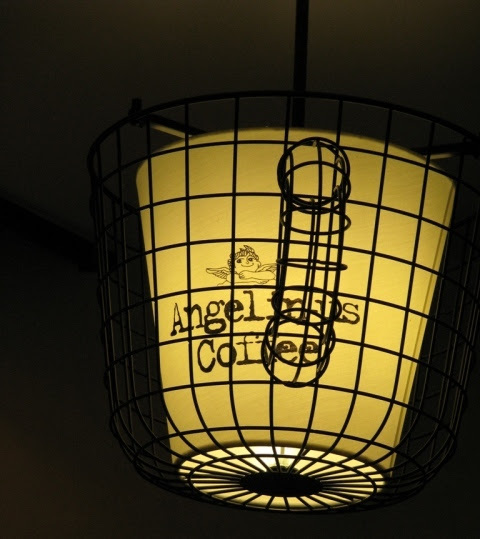 A fresh, smooth coffee taste is guaranteed at Angel-In-Us coffeehouse. 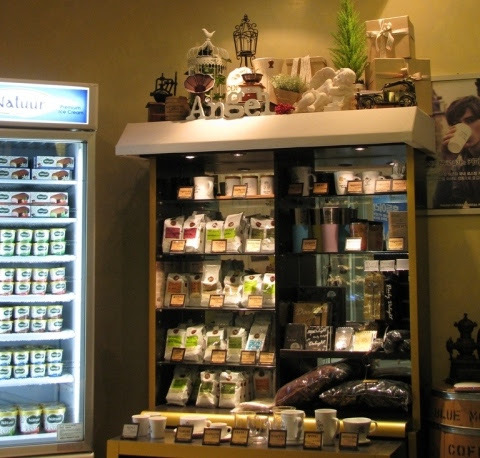 A range of desserts are also available so you may enjoy a light meal with your coffee: sweet and moist maple bread, Belgium-style premium waffles, bagels, muffins, sandwiches, and more. The interior of the Angel-In-Us stores are characterized by antique tables and chairs under soft lighting, providing a cozy ambiance. We met our tour guide beside the Cheonggyecheon Stream. But what struck me was the horse-drawn lit carriage waiting beside the stream for tourist’s merry-go-round stroll. It reminded so much of our kalesa except that theirs were filled with lights. The stream was filled with replicas of kings and queens and other representation of the Korean living during the time of the so called dynasties. 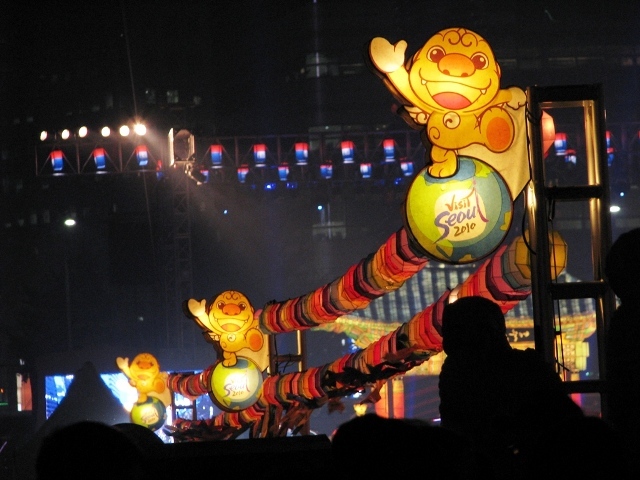 We then found out that it was the opening of the Seoul Lantern Festival with Haechi, the Seoul’s mascot, as the main entry. It was also during the festival that we learnt of G20 Summit and Seoul was the first city in Asia to host the said summit. Wow... The lantern festival also has a G20 miniature display of the presidents from the 20 member countries. According to our guide, the Cheonggyecheon Stream was a product of South Korea’s effort to uphold and preserve the natural environment. From Visit Seoul: Cheonggyecheon is an 11 km long modern stream that runs through downtown Seoul. Created as part of an urban renewal project, Cheonggyecheon is a restoration of the stream that was once there before during the Joseon Dynasty (1392-1910). The stream was covered with an elevated highway after the Korean War (1950-1953), as part of the country's post-war economic development. Then in 2003, the elevated highway was removed to restore the stream to its present form today. 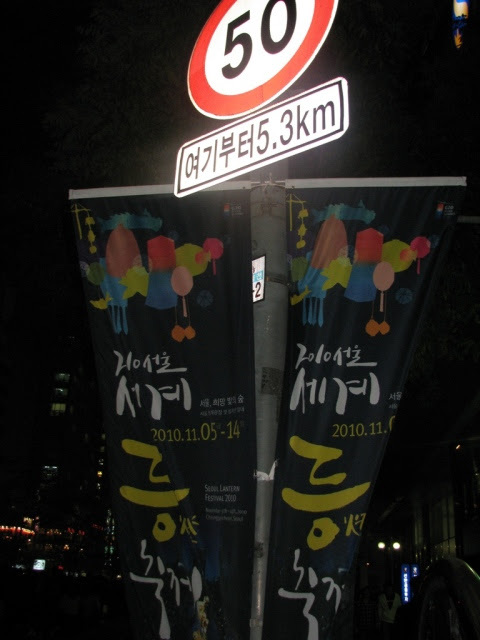 The stream starts from Cheonggye Plaza, a popular cultural arts venue, and passes under a total of 22 bridges before flowing into the Hangang (River), with many attractions along its length. After the Cheonggyecheon Stream, we hike our way to the N Seoul Tower for the Hanna tour finale. The Haechi statue served as a “welcome” greet to the tourist. 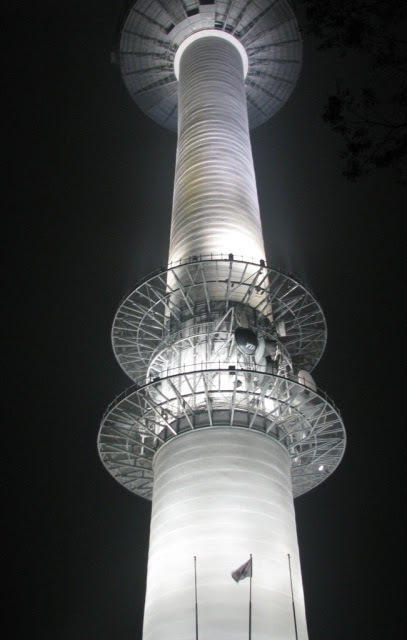 From Visit Seoul: N Seoul Tower was built in 1969 as Korea’s first integrated transmission tower beaming television and radio broadcasts across the capital. Since opening to the public in 1980, it has become a much-loved Seoul landmark. The tower’s main attractions include multi-colored digital art projected onto the tower at night, a digital observatory, a roof terrace, the HanCook restaurant, the n.Grill restaurant, and the Haneul (Sky) Restroom. 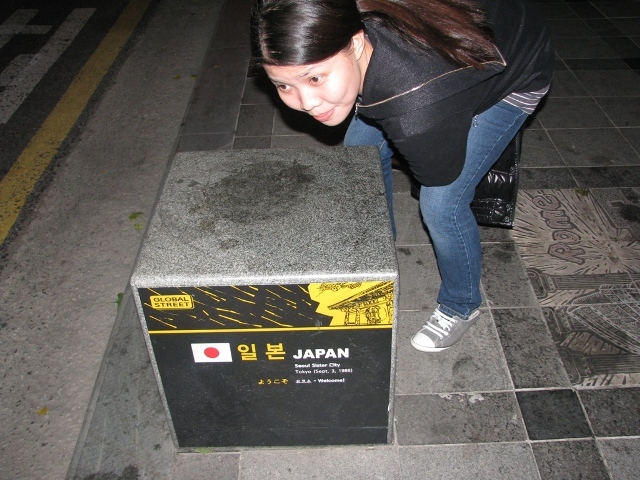 N Seoul Tower’s mountain surroundings on Namsan (Mt.) have made it a popular place to unwind for locals and tourists alike. Two huge teddy bears stood at the ground. This reminded me of the “bear song” from the Korean telenovela “Full House”. At the ground, aside from Haechi and the teddy bears, Christmas-tree shaped structures packed with keys are other attractions of the area. 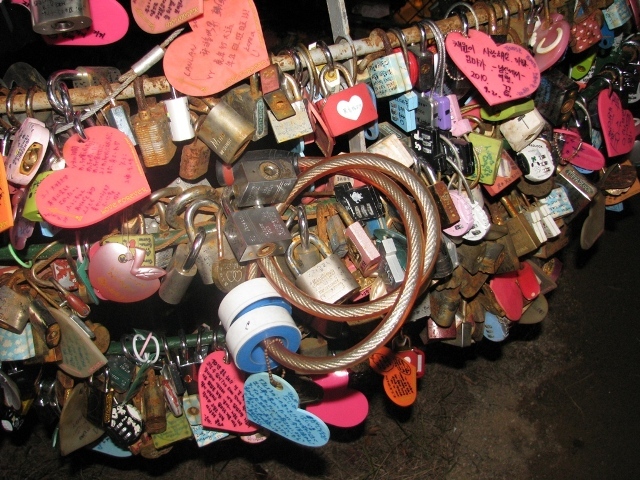 According to our guide, they call it “locks of love” where couples symbolically lock their love by a padlock seal or other form of locks. 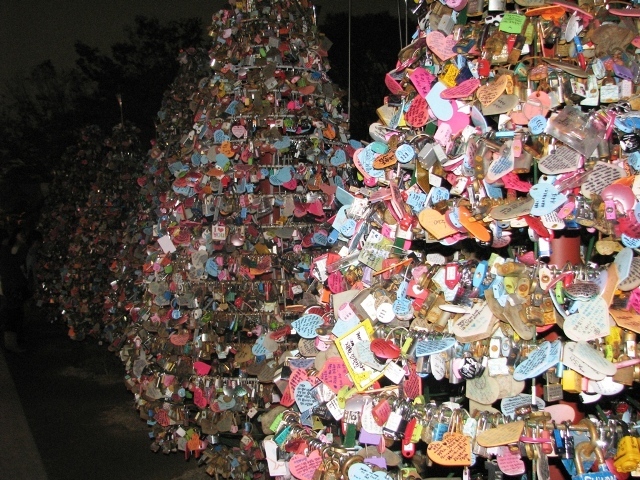 From Korea.net: These days the most popular attraction is the Locks of Love that hold a thousand different messages of love. Along the fences of the second floor observation deck, hundreds of thousands of locks hang from all sides, overwhelming the wire fence. 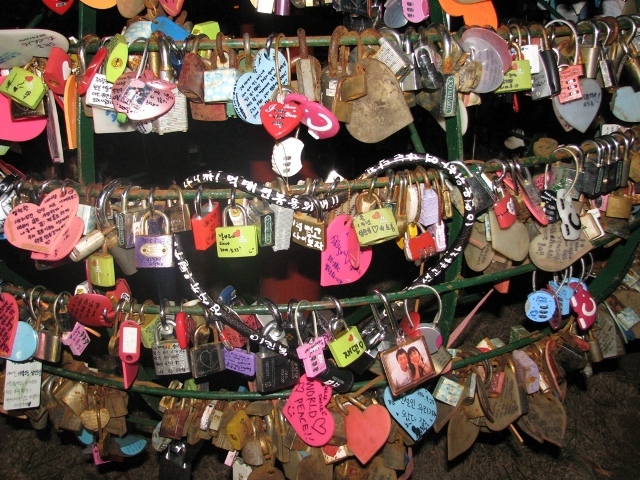 Couples, young and old, hang locks on the fences with handwritten messages of love. The locks hanging on the fences without their keys are meant to ensure the lovers’ vows to never separate. Couples can leave their keys in the Postbox of Love after lock-up. A part of the revenue from the keys collected in the postbox is donated to underprivileged adolescents. This campaign was designed to spread the spirit of love all across the nation. Hanging locks on the fences has become quite international as many tourists do the same when they come to the tower. The top of the tower is a digital observatory offering a 360 degree view the city. 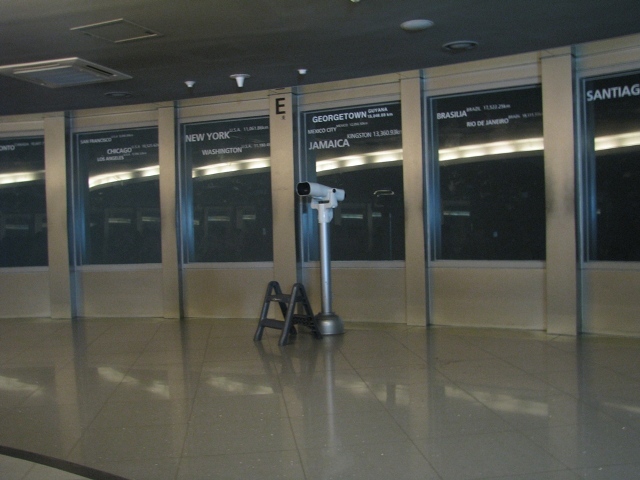 The distance of Seoul to other countries were written in its glass encasement. We bade goodbye to our lovely guide at 9pm. We were thankful to have a very accommodating guide and a photographer as well. She also shared her visit to the Philippines and she enjoyed Tagaytay most.